Today we would like to throw light on corporate responsibility and social sustainability system. Many organizations act responsibly towards the people, their employees, and communities to contribute to social development in the areas where they live and work. They think that it is the essence of their commitment to their corporate social responsibility and they are very right but there are some organizations those doesn’t live up to the expectations even more fulfill their regulatory requirements. Basic life saving first aid skills is one of the subject one should consider is their responsibility to provide life saving skills to their employees and to contribute to communities where they live and work. In order to respond immediately and effectively to emergencies/disasters, which may occur during work timing or commuting to/from home to office and vice versa. As most of the organizations collectively embrace the need to improve their impact on the society but the concept of sustainability is no longer just an investment in some of the occasional events, while I applaud increased efforts by number of organizations toward sustainable design and worker safety. There are some organizations those take responsibility of their services and products as well as invest in development of personal safety skills of their employees. First Aid to Save a Life Pakistan’s community training programs are also one of the service where we share basic life saving first aid skills at large-scale and not for profit. At large-scale and especially at corporate sector, we should consider this and contribute/volunteer towards our community and society such program those can make difference in the lives of the families of our employees, communities and our fellow citizens. 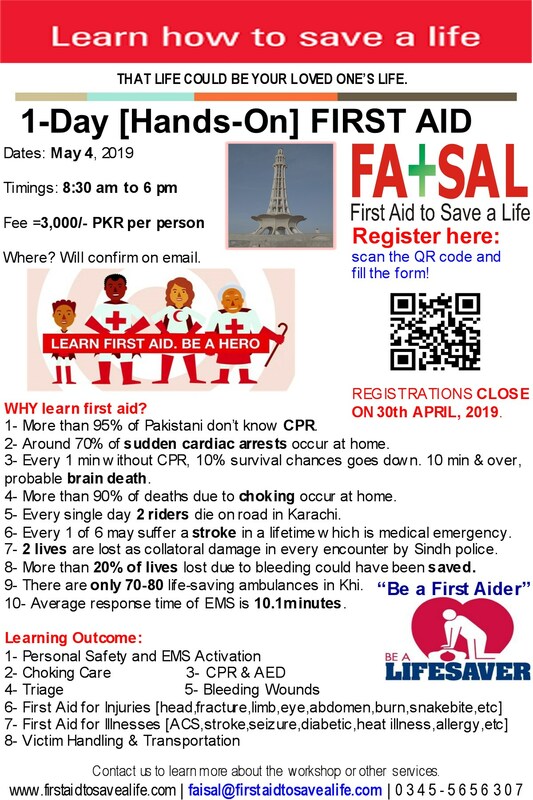 First Aid to Save a Life Pakistan also share the same sense of responsibility and have developed community training programs and currently working on many more programs and school safety program and AED implementation program are part of those efforts. Despite the fact that many organizations neglect this aspect in their corporate social responsibility we will remain active in incorporating personal safety awareness and life saving skills, to truly protect the future, protecting the lives of workers and serve to community and our fellow citizens. With this First Aid to Save a Life Pakistan also wishes our fellow citizens, a very happy Independence Day. Long Live Pakistan. This entry was posted in Uncategorized and tagged community training program, corporate responsibility, social responsibility, social responsibility needed to be sustainable, worker safety is social sustainability. Bookmark the permalink.